Excelente forma de promocionar artistas indies locales en una plataforma global . Aquí un reportaje de IB3 TV sobre este fenómeno global que no para de crecer . BalconyTV Mallorca is a weekly online TV show which combines the Mallorca music scene with International touring artists to bring to you a view on what’s going on in one of the most culturally active cities in the world. 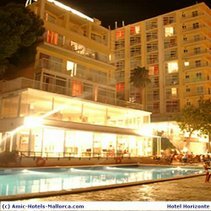 Filmed from the center of Palma de Mallorca many times and some time from Hotel Amic Horizonte the show features live performances of cutting edge artists as well as emerging bands and singers from the local scene. Launched in October 9, 2013. It has built on the BalconyTV phenomenon, which began in 2006 on a tiny balcony in Dublin. Now produced in 50+ cities, BalconyTV has had over 50 million collective views and has featured thousands of other independent artists the world over. Filmed from the center of Palma de Mallorca, the show features live performances of cutting edge artists as well as emerging bands and singers from the local scene.